Here in England, sun shining through our window blinds are quite a rarity, but with the coming of spring, the heavens of Newcastle has blessed us with a glimmer of hope–sunny days! Still quite windy but sunny nonetheless. In other words, its time to get the sun protection out! I'm not one of those people who are afraid of getting tan. Quite the contrary, I like the glow it gives me. It also justifies another foundation purchase to "match my summer shade". That said, I am learning to really care and protect my skin from the sun's harsh rays. There are many things that can get quite confusing when it comes to sunscreen: chemical vs mineral, SPF numbers, PA++ or +++ or ++++++++ however many plusses, broad spectrum, etc. I found a great infographic from Paula's Choice that pretty much sums it up, but let me point out some important bits from it. You need to use sun protection daily, even in the winter time. UV rays are always present when its daylight, even on rainy, snowy, or cloudy days. The intensity varies, but it is still there. Chemical and Mineral sunscreen are both great, you just need to choose what is right for you. I've tried both types and while they both perform great, it is more about the consistency and finish of the sunscreen that you need to think about. Chemical sunscreens tend to be lighter and more weightless on the skin. Some even have a matte finish which is definitely what you would want in the summer time if you have oilier skin. Mineral sunscreen is great if you are like me and have more sensitive, redness and acne-prone skin. The downside though is that it can feel heavy and sometimes leave a white cast. I got you covered though with my recommendations below for great mineral sunscreen that won't feel like you just slathered on a full tube of banana boat sunscreen. Apply sunscreen on top of whatever skincare you have on already. 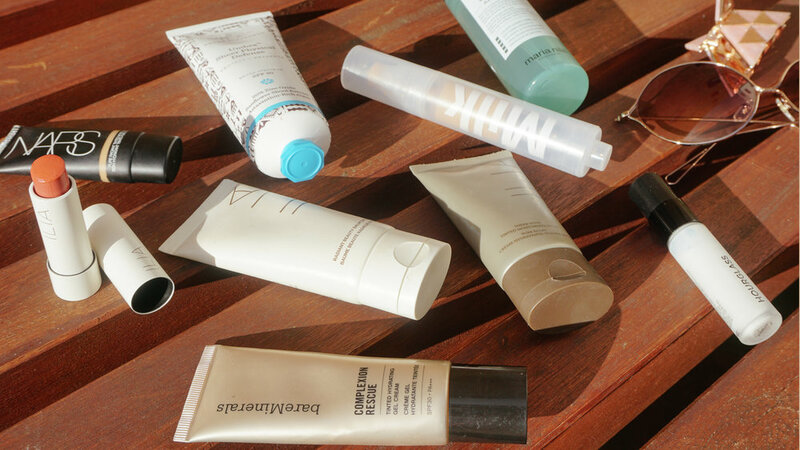 Sunscreen should be the last step of your skin prep. That allows it to be a barrier on top of everything else and prevents it from getting diluted. SPF is just a measurement to tell you how long you are able to be out in the sun without risk of sunburn. Most people with fair skin take 10-15 minutes for their skin to change colour, so if you have SPF 30 sunscreen on, multiply 30 with 10/15 and you get the minutes that you are protected. Bottom line: the lower your SPF, the more frequent you need to reapply. If you use a moisturiser with SPF 15 and a sunscreen with SPF 30, your SPF is still only 30, not 45. You are only protected to the highest level of SPF that you put on your skin. Such is the maths. It is always better to have a separate sunscreen and moisturiser instead of having it combined all in one. Much like a 2-in-1 shampoo vs. shampoo + conditioner. Convenient, but not necessarily the best option. As mentioned before, I primarily use mineral sunscreen as my skin leans more sensitive and dry. Radical Skin Perfecting Screen SPF 30 which I have sadly run out of and is currently out of stock everywhere is an all-time fave of mine. It is sheer, lightweight, and great for use in the city. My mom is a devotee of it too! The one that I currently wear on a daily basis is by Drunk Elephant called the Umbra Sheer Physical Defense SPF 30 which is an excellent sunscreen that has an impressive 20% Zinc Oxide content that surprisingly does not leave a white cast! Another favourite, although this one is quite situational, is Ilia Beauty's Radiant Beauty Balm SPF 20. This one can be quite greasy, but on days where I feel a bit parched, this sunscreen really perks up my skin and brings that glow back to my skin! Also, it smells quite lovely, unlike most sunscreens! I have tried different primers but the only one that truly works for me (even beating Chantecaille's £76 SPF 45 primer) is the Hourglass Veil Mineral Primer SPF 15. Yes, the sun protection factor is lower, but since you'll be wearing a separate sunscreen anyway, this primer just works! It makes my makeup last considerably longer, smooths my skin and preps it for makeup, and really just keeps my skin matte on the places I want it to be. Plus, you can buy a smaller "travel size" if you don't want to dish out the £55 for a 30ml (Still worth every single penny though). While I do always use a separate suncreen underneath my base, having SPF on your complexion products are always a plus point. My number one has got to be Milk Makeup's Sunshine Skin Tint SPF 30 which I have reviewed here. A close second is Ilia's Sheer Vivid Tinted Moisturiser SPF 20 which gives a very natural, skin-like finish. For all you organic girls, this one is for you! I love NARS' Pure Radiant Tinted Moisturiser SPF 30 and this has to be the easiest one to find. It has a satin finish which I love on my skin and has a higher coverage I feel compared to the ones mentioned previously. Last but definitely not least is BareMinerals' Complexion Rescue SPF 30 which is easily my longest standing favourite because of its literal skin perfecting qualities. It just gives the most radiant glow to your face while giving an impressive amount of coverage! Here I'd have to make yet another shout out to a product that I've already, and very sadly, finished: Bioderma Photoderm Bronz Dry Oil SPF 30. Not only does this product have the most heavenly fragrance, because it is a dry oil, it also gives a really nice sheen to your sunkissed skin while giving protection. Another plus point is that you can use it on your hair too! Speaking of hair, protecting your tresses from the sun is important too, especially if you have coloured hair like me! Maria Nila's True Soft: Argan Oil hair serum protects, smoothes, tames, and nourishes your hair. It also smells like juicy watermelons so you would always want this on your hair! Last but definitely not least is SPF for the lips. While there are plenty drugstore lip balms that do contain SPF, I am a lover of Ilia's Tinted Lip Conditioner SPF 15 in Bombora, a sheer coral red that gives a beautiful wash of colour to my lips while keeping it nice and protected. The texture is quite thin on this one and is definitely not on the waxy side. It also has a pretty sheen to it! Cutis, December 2012, issue 6, pages 321-326.